Further notes from South Sinai. For the Bedouin of the southern Sinai, Egypt’s great tourism revival cannot come fast enough. But will it solve their problems? The western focus of the advertising campaign is intended to attract more cultural and religious tourists, who — according to Egypt’s Chamber of Tourism — spend more money than poolside sunseekers. The campaign’s targets depend on attracting 25 percent of visitors to cultural or religious sites and persuading them to spend $100 per night. Also on the Minister’s wish-list are hikers and eco-tourists: his list of Egypt’s attractions includes ‘desert outings’.3 These two types of tourist are the most important markets for the South Sinai Bedouin I work with, who in recent years have come to depend on tourism. They are among Egypt’s poorest and most marginalized citizens, and have suffered disproportionately from the collapse in visitor numbers since the Revolution. With its promise of restored visits to St Catherine’s Monastery and the return of desert safaris, the campaign should be very good news for them. But how have these formerly nomadic herdsmen come to depend on tourism, and will its hoped-for revival help them? 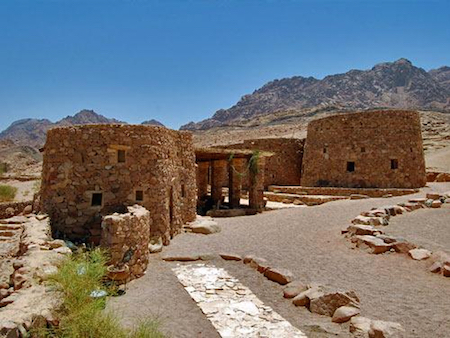 South Sinai: a ‘special destination’. Clicking on an image will enlarge it and display captions. SOUTH SINAI HAS always drawn settlers and travellers. The peninsula of which it forms the southern half creates a land-bridge between Africa and Asia. The region has been continually inhabited for over 10,000 years, and perennially traversed by peoples on the move: from Nabataeans, Romans and Old Kingdom Egyptians, to the Jews of the Exodus, conquering Muslims, early Christian monks and generations of Bedu (‘people of the desert’). After the Six Day War of 1967 and fifteen years under Israeli Occupation, Sinai was brought firmly back into the Egyptian state after 1982. Its southern population consists of indigenous Bedu of eight tribes and confederations, and the Egyptian settlers and migrant workers who now outnumber them two-to-one. It encapsulates the best of Egypt’s tourism opportunities. The glitzy resort of Sharm el Sheikh provides traditional sun-and-sea packages, but those — now the vast majority — who remain within its tourist enclave see little of Sinai’s glories. It is a place of superlatives and extremes. Its spectacular geology includes the highest mountains in Egypt, vast stony plateaux and parched coastal plains. Its mountains are green with aromatic herbs in spring and – in a good year – white with snow in winter. Its plains are among the hottest on earth, its coral reefs among the richest. It harbours relicts of fauna and flora from both the continents it connects: many of its species are rare and endangered, and include Egypt’s highest concentration of endemic plants and the world’s smallest butterfly. 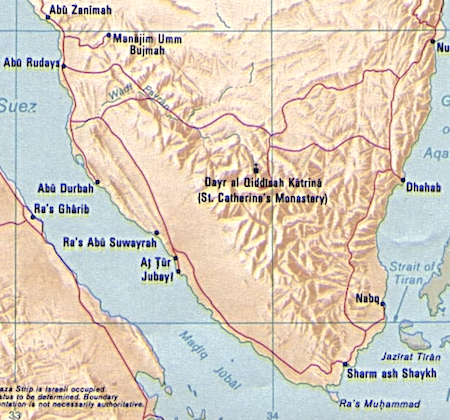 At the centre of the region below Mount Sinai (the mountain known now as Jebel Musa — ‘Mount Moses’) lies the Monastery of St Catherine, the world’s oldest continuously practising Christian foundation. Its UNESCO World Heritage Site status reflects its cultural and natural importance. The area is sacred to the three Abrahamic faiths: many Jews, Muslims and Christians acknowledge it as the route of the Exodus, and of Moses’ receiving the Ten Commandments. By any standards, South Sinai is a special destination. Bedouin livelihoods and social change. 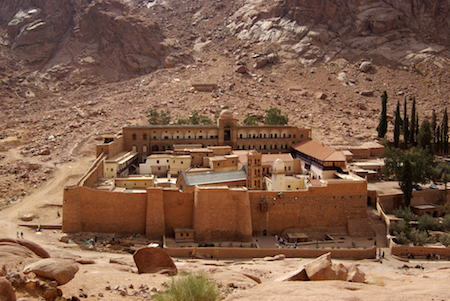 PILGRIMS HAVE BEEN attracted to the Monastery since the fourth century CE. Its complex fortress structure was started in around 530CE by the Roman Emperor Justinian, who sent a group of tough mountain herdsmen to protect and serve the monks. These were the foundations of the special relationship, outlined in an earlier article, between the monks and the Jebeliya Bedouin tribe who still populate the village of St Katherine close to the Monastery and the surrounding high mountains.4 Local livelihoods have always included working for the Monastery and guiding pilgrims, in addition to other waged tasks such as charcoal-burning or camel transport. These occupations augmented the core livelihoods of Bedu in South Sinai: moving seasonally with flocks of sheep and small goats, and a unique orchard horticulture probably learned from the monks.5 These two occupations — supplemented by hunting or fishing — were formerly enough to maintain a typical Bedouin family in meagre sufficiency, combining mostly dairy proteins from their flocks with garden produce. Goods not locally produced (eg rice, coffee or lentils) were bartered or bought with cash earnings from wage work and trade. In 1967, the imposition of Israeli administration after the Six Day War pitched Sinai headlong into an inflationary modern economy. This picture barely changed for 1500 years. Then, in 1967, the imposition of Israeli administration after the Six Day War pitched Sinai headlong into an inflationary modern economy. Paid work became readily available both locally and further afield, but Bedu had to settle in order to access it. Rapid reductions in flock size and the neglect of gardens followed. Local pastures could not sustain the combined flocks of many families living side by side. Men employed as migrant workers on Israeli construction sites could no longer cultivate their gardens. Traditional livelihoods quickly became unviable, while Israel’s rampant inflation made it vital for Bedu to earn cash. Older Bedu today look back on this time with mixed feelings: it was a time of social change, but they had work and could feed their families. During the Israeli Occupation unskilled paid work was plentiful. However, once Sinai returned to Egyptian rule in 1982, everything changed again. Hilary Gilbert’s ‘The Bedouin of St Katherine’, an earlier report from the Sinai, is here. As well as reinforcing an Egyptian national identity in Sinai, the Government of Egypt wanted to secure it from future incursions. It embarked upon an ambitious plan to ‘Egyptianize’ the peninsula by settling five million culturally and ethnically distinct Nile Valley Egyptians on its coasts and deserts. Almost 750,000 were destined for the largely dry and desolate South, whose population in 1968 had been around 4500. In practice this was never feasible given Egyptian reluctance to abandon the green and gregarious Nile Valley for the austerities of desert life. Today around 165,000 people live in South Sinai, over a third of whom are male migrant workers servicing the tourism industry, the rest being settled Egyptians and lastly some 40-50,000 Bedu. Since Bedu are not separately censused, no-one knows exactly how many there are. 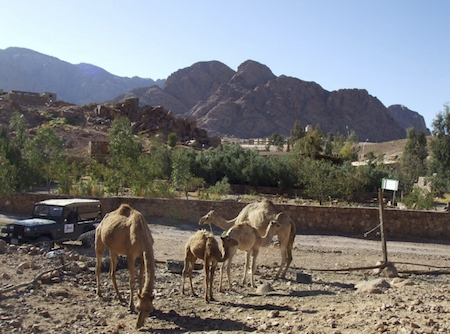 6 From the first, tourism was planned as the major driver of South Sinai’s development. From the early eighties its promotion as a mainstay of the Egyptian economy began. The Ministry of Tourism’s 25-year targets for South Sinai published in 1992/93 were exceeded within five years, by 60 percent in Sharm and 100 percent in St Katherine. Targets were revised upwards, and Egypt’s tourist industry grew by over 38 percent between 2003 and 2004 alone. By 2010 South Sinai accounted for approximately one-third of Egypt’s tourist revenue. EGYPTIAN AND INTERNATIONAL hotel owners have discriminated against Bedu with impunity. The state fails to provide a proper education for many, others have no schools at all, and their environmental life-skills are largely irrelevant to the tourist experience in Sharm. They do not fit the modern image that Egypt hopes to project to its visitors.9 But if Bedu aren’t employed in tourism, how have they come to depend on it? Sharm sprang up as an upmarket resort and diving centre catering for divers, families and the casino set. Hotel jobs went to trained and polished Egyptian workers with high-school English. But Sinai attracts another category of visitor for whom Sharm’s casinos and nightclubs are anathema: those on pilgimage, students and researchers, and those seeking the peace of the desert or the challenge of the wilderness. These travellers, often independent, need the expertise of Bedu to guide them away from tourist routes, up trackless mountains and down waterless wadis. Many feel connected to core Bedouin values: love of nature and quietness, simple material needs, good companionship and generosity. It is these travellers who have formed the staple business of Bedouin guides since the departure of the Israelis. Until the bombing of resorts in the early 2000s led the Israeli Government to issue strict warnings against crossing the border, former occupiers returned in droves to the mountains. International trekkers recorded by the authorities peaked at 12000 in 1997. In the nineties it was commonplace for popular camping grounds in the high mountains to be full to overflowing with hikers, and many Bedu made a modest living from guiding and cooking for these back-country trekkers, religious wanderers or student groups. Alive to good business opportunities, many developed specific expertise to cater to clients of all nationalities and interests, from Korean pilgrims to Russian mountaineers: some speak an impressive array of languages, others learned climbing skills, shiatsu massage techniques, and — memorably for my biologist husband and his students — the Latin names of local plants and wildlife. THESE SKILLS WERE encouraged in the ‘nineties by the newly established St Katherine Protectorate, a major National Park covering much of South Sinai’s mountainous centre. Funded by the European Union, the Protectorate’s first Director — a European conservationist with global experience — conceived it as a community-based conservation venture. The opportunity costs to local people of implementing conservation measures were to be offset by new opportunities, primarily in ecotourism. His respect for Bedouin skills and research into their attitudes were a welcome change from a national discourse that presented Bedu as primitive and incapable. Two projects were set up to enable Bedu to profit from visitors keen to experience wild Sinai: a handicraft project for women to make and market embroidery to tourists, and an eco-lodge, known as Al Karm. Imaginatively conceived and picturesquely sited in an abandoned ancient village, Al Karm was intended — like many conservation-led development ventures — to become a sustainable Bedouin business. The Protectorate provided start-up costs, marketing materials, promotion and training for the Bedouin owner-manager and his staff. But at the end of EU funding the Protectorate’s management was transferred to the Egyptian authorities. They sought to share the venture’s profits. However, an independent evaluator found that neither party had the business or technical experience to manage a commercial enterprise. Protectorate support dried up and with it all promotion. Al-Karm lies a punishing and expensive 4×4 journey from tourist centres, so it picks up no passing trade. It has no communications, making it almost impossible to take bookings. The evaluators note: ‘Local populations with limited access to formal training or education cannot be expected to have the management skills to take over and run a commercial business without a period of long-term ‘hand-holding’.10 Today, beautiful though it is, the eco-lodge receives few visitors. It is hard to resist the conclusion that the Bedu, who with continued support could have learned to run it, were set up to fulfil expectations of their failure. For development interventions to work, long-term commitment to enhancing local skills must accompany funding. In addition, donor bodies must commit to understanding how power relations operate in target communities. Otherwise they may leave their supposed beneficiaries worse off than they found them. Despite such challenges, for two decades a steady stream of visitors to St Katherine provided work for local people. Voluntary and local business enterprises developed programmes for restoring Bedouin gardens, enabling owners to diversify into tourism while using traditional skills. By local estimates, before the Revolution some 5000 people annually found peaceful renewal in these mountain oases11 Tourists and pilgrims to Mount Sinai, climbing the mountain at night to see the sun rise, numbered over 300,000 in the peak year of 2000, each party requiring its own guide.12 Meanwhile desert safaris increased and formerly remote oases such as ‘Ain Hodra were able to offer basic shelter and facilities for overnight trips of two to seven nights. The presence of so many people climbing Mount Sinai still made the Jebeliya in St Katherine the envy of other tribes; but with diving on the coast and camel treks in the wadis and mountains, a large proportion of Bedu made their living in tourism. As tensions in the Peninsula grew, security concerns led in 2008 to the banning of desert safaris of more than two nights, and in 2010 to their complete proscription. THE EARLY 2000s saw the growth of political and religious radicalism in small pockets of North Sinai — a response both to the long-term neglect of Bedouin prospects and to the permanent political tensions surrounding the Rafah crossing into Gaza and the Israeli border. In 2004, 2005 and 2006, bomb attacks took place in the resorts of Taba, Sharm and Dahab, with major loss of life. Originally aimed at disrupting the tourist-dependent economy of the Mubarak regime, the later atrocities were widely held to be acts of revenge for the brutal crackdown on North Sinai Bedouin communities by security forces following the Taba attack. As tensions in the Peninsula grew, security concerns led in 2008 to the banning of desert safaris of more than two nights, and in 2010 to their complete proscription. No distinction was made between North and South Sinai. The major livelihood of hundreds of families in the South was removed at a stroke. Worse was to come. In March 2012, after a complex string of events ending in the shooting by police of a Gararsha man, two American tourists and their Egyptian guide were stopped on the road by his relatives and held, in a bid to gain bargaining power with the police. The bid failed spectacularly. Despite local people securing the release of the ‘hostages’ after a few hours, and despite the televised account of their captors’ hospitality, news of the first kidnap in South Sinai hit international headlines. As frantic behind-the-scenes efforts by Bedouin leaders took place to mitigate the damage, in western Embassies concern was mounting. Within a few weeks nearly every major source of foreign tourists had declared South Sinai — outside the enclave of Sharm — to be unsafe for visitors. Excepting a brief window, the UK’s Foreign and Commonwealth Office has for three years advised against ‘all but essential travel’ to St Katherine. Visitor numbers have slowed to a trickle. What does this mean for the Bedu? THE CONSEQUENCES OF loss of income and increased insecurity are not hard to predict. Many people are worn out with worry and succumb to illness linked to stress and poor nutrition, in addition to the normal hazards of life in a harsh environment. In 2007-8, some 37 percent of my interviewees complained of illness, using the ubiquitous description ta’baen. The term is used to describe anything tired and sick, from a wilted lettuce to a diseased plant or animal, to people’s own feelings. Today, no fewer than 67 percent of the Bedu we interviewed say they are ta’baen — both physically ill and exhausted by life. Selling handicrafts to tourists provided many women with a small independent income, a factor known to contribute to the successful development of children. Less predictable are some other outcomes. Lacking a market, the Protectorate’s women’s handicraft project also collapsed, reducing household incomes still further. The economic contribution of women in Sinai rarely derives from work outside the home, so its importance is easy to underestimate. Selling handicrafts to tourists provided many women with a small independent income, a factor known to contribute to the successful development of children. Many had used their small but dependable income to take out hire-purchase agreements for goods to make their lives easier, such as a fan for those with an electricity supply, or a gas-ring to cook on instead of an open fire. Most women had husbands or brothers who could repay these loans when the project closed. But for some — divorced or widowed women with no male relatives — the demise of the project was a catastrophe. Loan default is punishable by imprisonment, and several women faced prison and the break-up of their families for sums as small as EGP300 – (about £25 or $40 at current rates). Our community foundation15 was able to pay off their loans and their legal costs, and no one we knew about went to jail — this time. But families, especially those headed by women, are acutely vulnerable to factors outside their control. What can be done to bring the tourists back? By continuing to insist that South Sinai is unsafe, western governments contribute directly to poverty and desperation that could lead to instability and radicalization. While there have been occasional incidents in the South, primarily attacks on security personnel, the vigilance of Bedu and security forces alike have ensured the safety of almost all visitors to South Sinai – the four Korean pilgrims killed by a suicide bomber on the Israeli border at Taba in 2014 were a tragic exception. The major economic summit held in Sharm in March this year — an obvious target for terrorist attack — passed off without incident. The few events in the South, worrying as they have been, seem not to form a pattern of attacks on Sinai’s tourists, but to be as contingent as others occurring across a deeply contested globe. From that perspective, there is nothing special about South Sinai. Strenuous efforts have been made by Egypt’s government to encourage domestic visitors, including a conference held in St Katherine last year. As a result there has been an upturn in Egyptian tourists. This is proving a mixed blessing, as many Egyptians have little idea what to expect from Sinai’s environment and arrive ill-equipped for its challenges. Keen to see snow for the first time, a party of young Egyptians went astray in a high mountain wadi last spring; four lost their lives. Sociable and gregarious Egyptians are often ill-at-ease with the silence and peace of desert landscapes. Some complain of a lack of entertainment: others play loud music to liven things up. Current plans to cater for this tendency include reviving a scheme — scrapped amid international outcry in the nineties, but now back on the table — to run a cable-car up Mount Sinai. That the scheme clearly violates UNESCO conservation precepts seems not to deter the planning authorities. All this does not go down well with those who see their role as offering the hospitality of their homeland to guests from outside. One guide told me: ‘The Egyptians won’t be happy till the wadis are paved with tiles, so they can hear their shoes go click click’. St Katherine itself is at the centre of attempts to revive trekking. 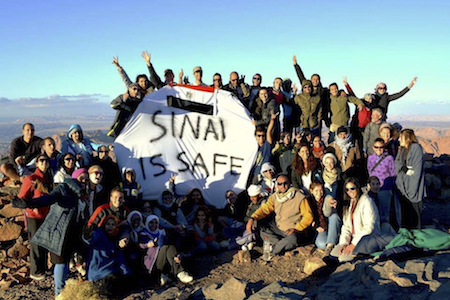 In October 2014 and April 2015 treks were organized by Sinai specialist Ben Hoffler and local guides under the banner ‘Sinai is Safe’. The venture might better be called ‘South Sinai is Safe’; but it attracted some 70 participants and gained coverage in online and social media21 It is an important step towards demonstrating that daily life goes on in South Sinai, practically untouched by the geopolitical upheavals battering the North. The Egyptian Government recently reversed a security-led decision to make all non-package travellers buy visas in advance from the Embassy in their country of origin rather than on entry. This would have decimated what was left of the independent tourist market. A similar gesture by western governments to alter their travel advice, basing it on fact rather than fear, would do much to bring the hikers and pilgrims back and restore legal livelihoods to the Bedu. Egypt’s tourism campaign: will Bedu benefit? Pragmatic commentators have pointed out that funds devoted to Egypt’s advertising campaign might better be spent on regulating operators, improving the country’s battered infrastructure, and addressing the nature of the tourist experience Egypt offers. Municipal authorities might build fewer statues and mend more roads. Though many foreigners cherish a notion of Egypt as a dream destination, the reality of sales hassle, noise, litter and long waits at checkpoints still tarnish the allure of the Land of the Pharaohs for those seeking antiquity and atmosphere. Once disenchanted, many don’t give Egypt a second chance to impress.22 This is a major issue: repeat business should be a mainstay for a country so accessible from Europe, and which has made such strides to improve its tourist experience in recent years. Checkpoints excepted, Sinai is largely free of such irritants. But for Bedu to benefit, there needs to be a revolution in the way they are viewed. It comes down to respect and trust. I noted above the Egyptian view of Bedu as primitive, but it goes deeper. Bedu are seen as ‘not really Egyptian’, as collaborators during the Israeli Occupation, and labelled ‘Sinai Jews’. Until recently they were barred from serving in the Egyptian armed forces. They seem neither respected nor trusted by those charged with developing Sinai, who rarely consult its indigenous residents. For centuries Bedu have lived in this marginal land, husbanding its scarce resources and becoming experts in its ecology, yet projects routinely ignore their knowledge. ‘We are engineers – you are Bedouin. You think you know better than us?’ Roads built in wadi beds are thus washed away by the first flash flood, houses built on flood plains lie unoccupied by their intended Bedouin residents, big dams built at wadi mouths are broken up by floods, while small Bedouin dams built close to mountain water sources hold fast, retain the water and slow its force. The Army has recently consulted Bedouin leaders about proposed development for both halves of the peninsula (for which EGP 10 million (around £850,00 0r $1.4m) has been earmarked — a marked contrast with the $45 billion proposed investment in Egypt’s new administrative capital). The army wants to build power plants and granite quarries. The Bedu have asked for sheep23. They know they can make their living from sheep. They know no one will employ them in the power plants and quarries. If a revival in tourism is to bring real benefits to Bedu, then, the authorities must take a new view of their value. Bedouin culture should be respected, not commodified for ersatz excursions. Security forces should recognize the Bedouin contribution to safeguarding Sinai and lift the ban on desert trips, so visitors can be offered hospitality in an actual Bedouin tent. Bedouin ecological expertise should be recognized; they should be consulted and involved in Sinai’s infrastructure developments. Many Bedu are entrepreneurial: they should be supported and encouraged to develop businesses (not only in tourism). That means education outreach, and banks providing loans on reasonable terms. All this is a wish-list far from realization today, and the recently foiled attack on the prime tourist site of Karnak may set back wider attempts to re-brand Egypt as a destination. But there are small signs of progress in Sinai: the army consultation — whatever its outcome — and the determination of people who love the place and its people to declare ‘Sinai is Safe.’ For the Bedu, change cannot come too soon. Dr Hilary Gilbert is Research Fellow in the School of Life Science, University of Nottingham. She is the only British anthropologist currently working with South Sinai Bedu. Her husband Prof. Francis Gilbert has led a research project investigating the ecology of the St Katherine Protectorate since 1986. Together with Bedouin and Egyptian colleagues, they co-founded the Community Foundation for South Sinai and its UK-registered partner organization, The South Sinai Foundation. Her previous note from southern Sinai appears in the Fortnightly here. This Fortnightly Review article is filed under the following rubrics: History & Travel. Publication: Tuesday, 11 August 2015, at 10:15. Options: Archive for Hilary Gilbert. Bookmark the permalink. Follow comments here with the RSS feed. Post a comment or leave a trackback.